On Sale Now! Free Shipping Included! 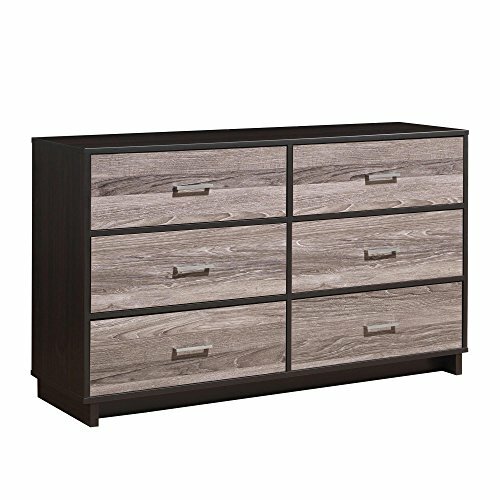 Save 9% on the Ameriwood Home Colebrook 6 Drawer Dresser, Espresso/Rustic by Ameriwood Home at Indsight. MPN: 5969500COM. Hurry! Limited time offer. Offer valid only while supplies last. The Ameriwood Home Colebrook 6 Drawer Dresser gives you all the drawer space you need to organize your clothing in a simple style with you in mind. The Ameriwood Home Colebrook 6 Drawer Dresser gives you all the drawer space you need to organize your clothing in a simple style with you in mind. The 6 large drawers will easily keep folded shirts, pants, undergarments or even extra bed linens so you no longer have to hide your items in the laundry room or under your bed. The dark brown espresso woodgrain chassis and rustic medium brown drawer fronts fit in with any color scheme. The copper handles create the perfect finishing touch to the drawer fronts. The Colebrook dresser has a simple, yet sophisticated style for any bedroom in your home. This large dresser measures to be 30.875”H x 53.25”W x 15.625”D and should be assembled and moved by 2 adults. Two adults are recommended for proper assembly of this dresser. Assembled dimensions: 30.875"H x 53.25"W x 15.625"D. Shipping weight of box is approximately 136.70 lbs.